Johanna has been the Cyrenes musical director since September 2013. She was born in Hungary, and received her musical training in Vienna before emigrating with her husband, Australian musician Max McBride in 1979. The Song Company, Canberra Boys Choir, Canberra Youth Choir, Llewellyn Choir, SCUNA and A Chorus of Women are among the many ensembles she has worked with as accompanist, conductor or musical director in Sydney, Canberra and regional Australia. She has directed numerous music theatre performances and choral festivals. Johanna’s hopes for the choir this year illustrate well her approach to singing. enjoy the pleasure of beautiful, vibrant harmony & ensemble singing. 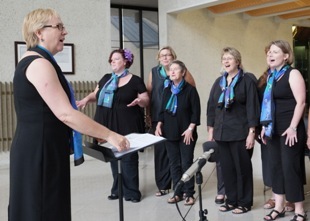 Glenda was the choir's previous musical director in 2012 and most of 2013.